Good Sunday my friends and Happy Mother’s day! I’ve finally finished painting my two pairs of feet and hands, and I am satisfied with them. As I’ve previously confirmed, I intend to sculpt more of them… and I pretty much liked it! I will see you very soon with the continuation of a previous project. Have a good everybody! Bon dimanche mes amis et bonne fête des mères! J’ai enfin terminé de peinturer mes deux paires de pieds et de mains et j’en suis satisfaite. Comme je l’ai précédemment confirmé, j’ai l’intention dans fabriquer d’autres…J’ai aimé les réaliser! On se revoit très bientôt avec la suite d’un autre projet. Bonne semaine à tous! My BJD is now painted! Good evening to all! Sorry for not posting yesturday, due to technical problems with my computer…However, I finally finished painting my dear lovely lady, and I’m satisfied with her! 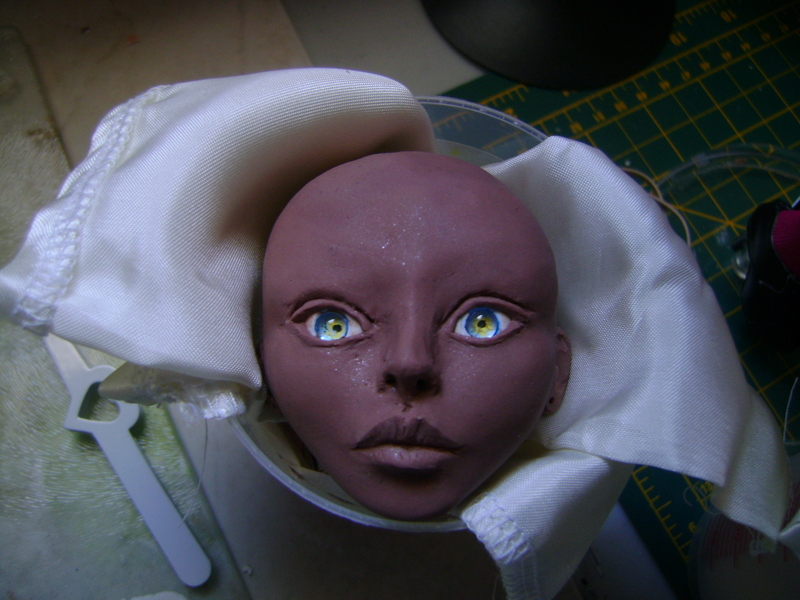 Although some improvements are still needed in terms of sculpting and painting, but it will happen with my next BJD doll! The most important for me right now, is to master the different techniques and run them with confidence. It is the only way for me to improve myself and not forgetting that practice and more practice are needed! At the point where I write, I’m in the process of putting together my doll and I’m honestly nervous and to see the final result! Bonsoir à tous! Désolé pour hier soir, je n’ai pas pu publier quoique ce soit, du à des problèmes techniques d’ordinateur…Mais bon, j’ai enfin terminé de peindre ma chère demoiselle et j’en suis satisfaite! Quoique quelques améliorations devront-être apportées en matière de modelage et de peinture, mais cela se passera avec ma prochaine poupée BJD! Le plus important pour moi, en ce moment, est de bien maîtriser les différentes techniques et de les exécuter avec assurance. C’est la seule façon pour moi de m’améliorer et sans oublier la pratique et encore la pratique! Au moment où je vous écris, je suis en processus d’assembler ma poupée et j’en suis honnêtement nerveuse et de voir le résultat final! Good Sunday to you all! As I promised, here are the two heads I have created, but photographed with better lighting! 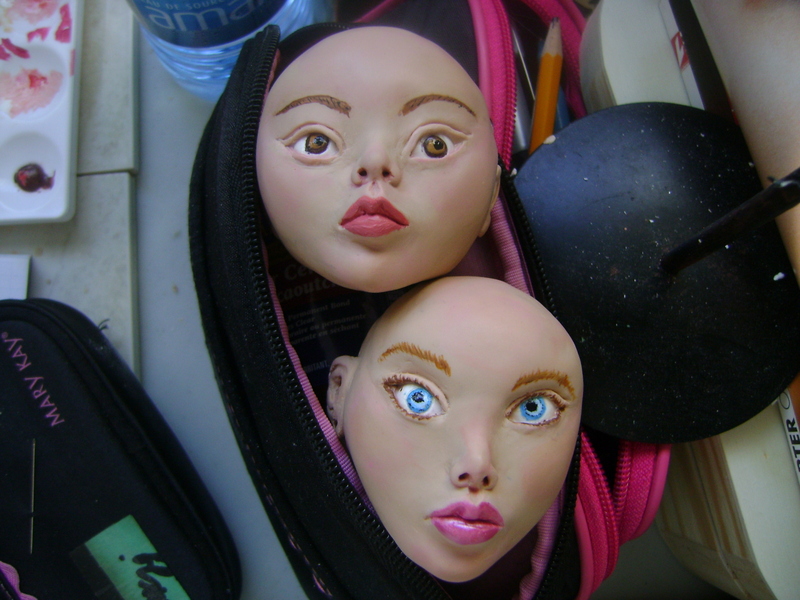 Although you don’t see it very well, the doll head on the right, the smallest one, has blue glass eyes. The other head has handmade Swarovski Crystal eyes. Personally, I prefer by far the quality and depth of the eyes made in Crystal! These eyes provide an unusual greatness of soul to my ladies! 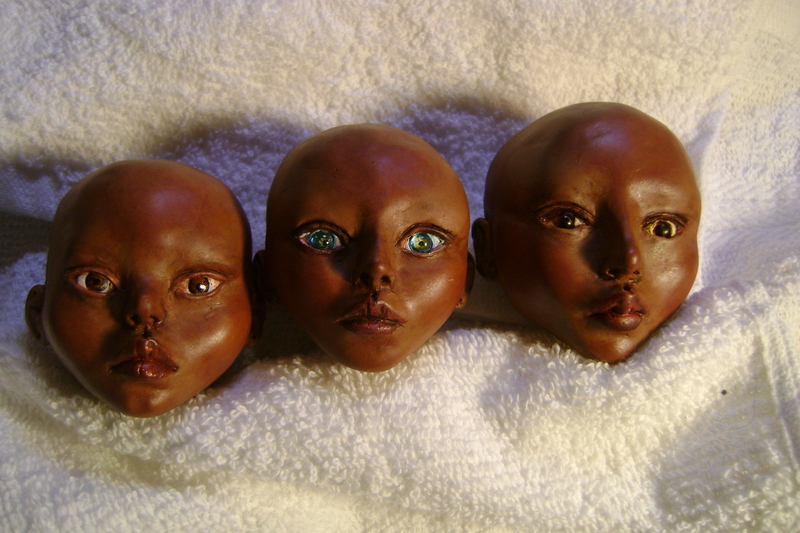 I love Crystal so much that I couldn’t help myself to make nearly a dozen pair of eyes for other future dolls. Stay connected for more my friends! Bon dimanche à tous! Comme promis voici les deux têtes que j’ai créées, mais photographiées avec un meilleur éclairage! Bien que vous le voyer mal, celle de droite, la plus petite tête, possède des yeux bleus en verre. L’autre tête, quant à elle, possède des yeux de cristal Swarovski fait main. Personnellement, je préfère de loin la qualité et la profondeur des yeux de cristal! Ces yeux apportent une grandeur d’âme peu commune à mes demoiselles! J’aime tellement le cristal que je n’ai pu m’empêcher de fabriquer près d’une douzaine de paires d’yeux pour d’autres futures poupées. Rester connecter pour la suite mes amis! Hello! On tonight’s post, I will continue with Glòria, but now painted! I have to admit that while I was sanding her with water and sandpaper, and soon after, I got a bit worried: the clay looked like wax and kind of fragile. I had to wait almost a full week before polishing her. Kato polyclay looks quite translucent and silky, just like Cernit polymer clay. Also, I tried to make her painted face a little different. Though I normally love my dolls make up to look more natural, this time with Glòria, I added more eye shadow than usual. I don’t know if I will do this for future dolls, but painting her was pure joy! Hello! I want to share more photos of of Samynah, Filsan and…Brielle! 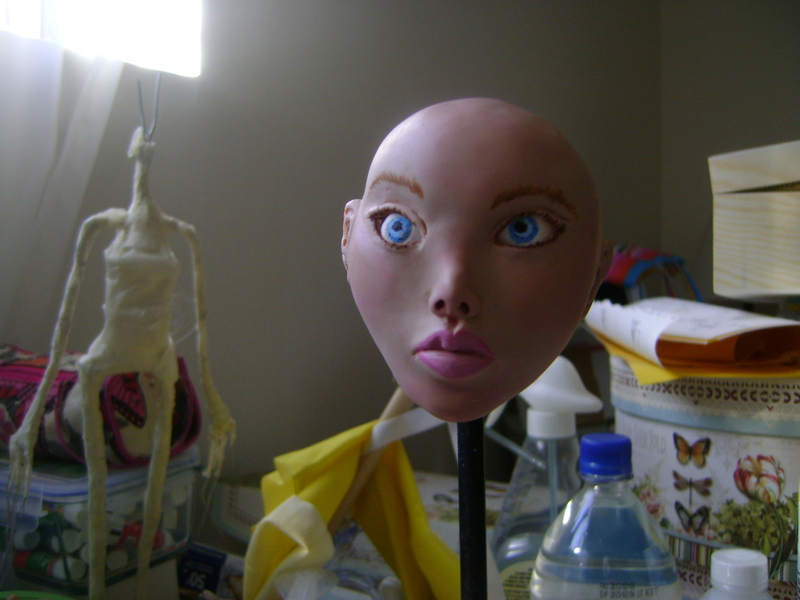 Brielle is the second doll I sculpted in early march 2013. 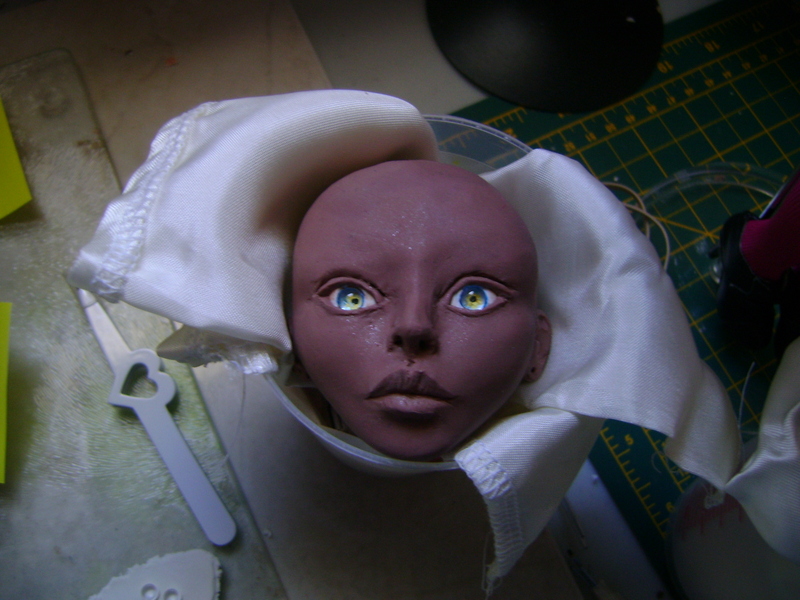 The first doll created doing that early year was Iris, which I will both present this week. Stay in touch! Good evening! Yesterday, I present Samynah, tonight it is Filsan turn. In Somalian, this name means, more mature then her age. She was created with the same polymer clay mix of Samynah. Her eyes were handmade by me. The technique that I used was very simple: crystal cabochon, polymer clay and acrylic paints. Filsan head sculpt is an important one, she’s the one who set Atelier Miss Georgia aesthetic. 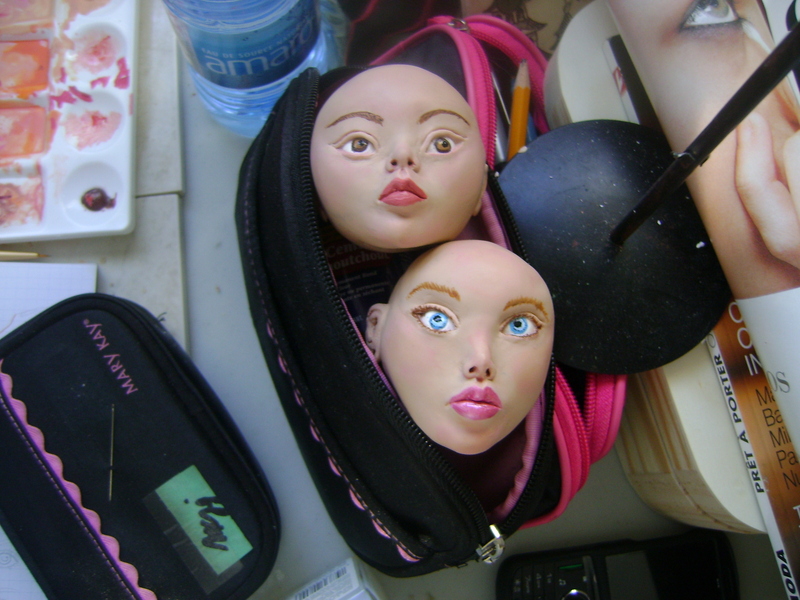 Also, since both dolls heads were created in the same month, January 2013, both were sand and painted a the same time. More pictures of them painted tomorrow. Hello! More post will be featured in few days. I’ll explain on how I’ve learned to sculpt from various books, DVD’s and on the internet. Good evening! As I promess, I’m showing to you guys two head sculpt, Clara & Sophie. Sophie’s head was sculpted a the same time as Clara. Their was some clay left and I felt sculpting a second head was the right thing to do. Good evening to you all! On the previous post I have show my Clare on painted here she is now totally painted and lightly blush. For a first doll I was pretty much satisfied on how she looked. 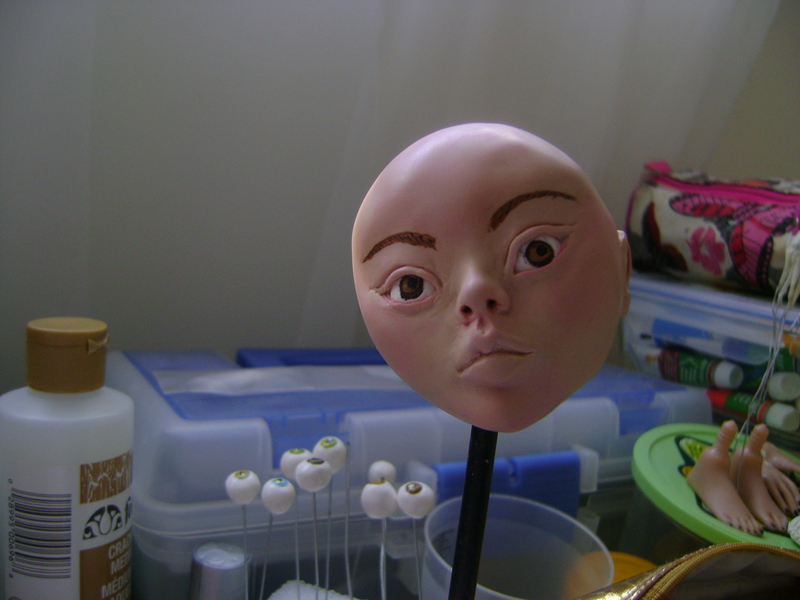 Tomorrow more photos of Clara and…Sophie head painted!